Robert Varley, chief executive of the Met Office in the UK, has been elected first vice president of the World Meteorological Organization (WMO). Varley is the UK’s permanent representative to WMO, and a member of the WMO executive council. Varley will support David Grimes, WMO president and assistant deputy minister for Environment and Climate Change Canada. Grimes presides over the sessions of congress and the executive council, which guide WMO activities in research and services related to weather, water and climate. 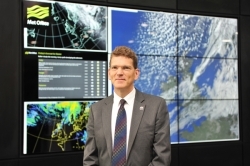 Varley has been chief executive of the Met Office since 2014. He is a member of the WMO executive council’s working group on strategic and operational planning, as well as working groups on disaster risk reduction and gender mainstreaming. Varley was elected to fill the post vacated by Divino Moura of Brazil in a electronic ballot among WMO’s 191 Members. The positions of WMO second and third vice president will be filled in due course.